Android's share menu is, to put it kindly, a mess. And four years ago, Google made it even worse, with the introduction of the dreaded "direct share" menu in Android Marshmallow. While nice in concept, the feature has turned out to be a huge annoyance in practice: every time you go to share something in Android, the share menu pops up, and then the direct share dialogue appears, displacing all the options and generally just getting in the way. It doesn't help that the menu rarely actually suggests anything useful, either, and has led almost everyone to loathe Android's share menu in its entirety. But, if you're on a Samsung or LG phone - or have root on most other devices - you can turn off the worst part of it. Disabling direct share on Samsung phones couldn't be easier, and is actually one of the best features Samsung's implemented as part of its modified Android software. Once disabled, you will no longer see suggestions to share to individual contacts in apps, and your share menu will be restored to only show app and app actions (with no pesky re-flowing, either). Note that disabling direct share does not stop apps which use custom share menus like Google Photos from displaying their built-in suggestions for sharing to individual contacts. It will only affect apps which utilize the stock share API in Android. Disabling direct share on LG phones is basically identical in process to the Samsung tutorial above, but searching for it is a bit different. 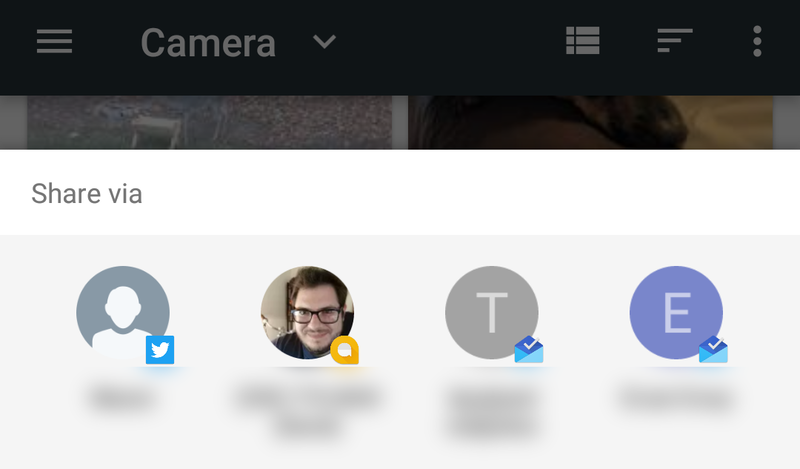 Once again, disabling direct share does not stop apps which use custom share menus like Google Photos from displaying their built-in suggestions for sharing to individual contacts. It will only affect apps which utilize the stock share API in Android. Unfortunately, doing this on a non-LG or Samsung smartphone generally isn't as easy. Most other manufacturers don't include an option in their software to disable the direct share menu, and that's pretty frustrating - we agree. Direct sharing can be disabled on most other phones... if you have root access. This is a non-trivial step for a phone that does not have an unlockable bootloader, and rooting methods are going to vary depending on which handset you have. We suggest looking up rooting methods for your individual device. Some will be easy (comparatively), and some may not be able to achieve root at all. From there, the simplest method is to push the XML file found at this link to your phone over ADB. If you're unfamiliar with ADB or rooting, this method may not be for you, and honestly, it's a lot of trouble to go through if your phone isn't already root access enabled. Enabling root access could have security implications, and may disable your ability to use applications like Google Pay or Netflix, so be forewarned: this is for advanced users only. All that said, Pixel users may soon be getting a direct share reprieve: the Android share menu is getting a full redesign in the "Q" release of the platform that should be much faster and more streamlined. At least, we hope so.